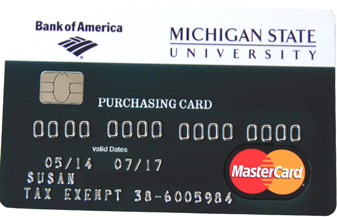 The Pcard is one of three primary ways to buy at MSU. The Purchasing Card (Pcard) Mastercard® credit card program delegates purchasing authority and capability to MSU staff. It does not tie to or affect your personal credit in any way. The Pcard, a MasterCard® issued by Bank of America, eliminates the need for small-dollar requisitions, direct payment vouchers, reimbursement vouchers, and petty cash funds and is convenient for items such as conference registrations and subscriptions. Using the Pcard provides quicker turn around time, greater flexibility, and reduced paperwork on orders. Card applications may be filled out in the Finance System. Upon completion, you will need to attend an orientation class. Financial transactions are processed in the Finance System.